Parkdale is a neighbourhood in south-west Toronto, spanning approximately from Roncesvalles Ave. to Dufferin St. from west to east, and Lake Ontario to Dundas St. from south to north. Gentrification is occurring in Parkdale. This is happening through the conversion of rooming houses into single-family homes, high-end condos being planned by developers, and attempts to rebrand the neighbourhood as “Vegandale”. In the face of these changes, affordability is a concern for residents in this community that has traditionally been seen as welcoming to a diverse population. This is especially true for those in south Parkdale, where in 2016 86.6% of people were renters (compared to 47.2% in the overall City of Toronto) and the median household income was $41,761 (compared to $65,289 in the overall City of Toronto). 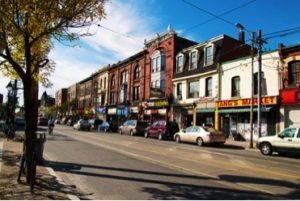 Is Gentrification in Parkdale an Issue of Environmental Justice? The term ‘environmental justice’ essentially refers to a notion that there should be an equal sharing of environmental benefits and burdens amongst a population. And yes, gentrification in Parkdale is an issue of environmental justice. The increasing development caused by gentrification can result in increased density, reducing residents’ ability to access outdoor community space, and creating increased pollution and congestion, thus deepening environmental burdens. Increasing development may also result in housing and retail spaces being developed that are not affordable, which produces a benefit for those able to access those spaces, but a burden for those in the area who cannot. Are there any legal remedies? The legal regulation of land use planning in Toronto is complex. It is governed by a whole host of laws, policies and actors including the Planning Act, Provincial Policy Statement, Toronto’s Official Plan, the Local Planning Appeal Tribunal, and the Committee of Adjustment. I will provide the basics here, but for further information, you can read citizens’ guides published by the Ministry of Municipal Affairs and Housing. The Planning Act (the “Act”) is provincial legislation that creates rules for how land may be used in Ontario. An important feature is section 37, which allows the City to “authorize increases in permitted height and/or density through the zoning bylaw in return for community benefits, provided that there are related Official Plan policies in place”. ‘Community benefits’ can be a tool to offset the negative effects of gentrification on a community, and could include affordable housing, employment opportunities, and community and environmental improvements. Toronto’s Official Plan outlines planning goals and guidelines about land use. Thematic areas include employment, environment, heritage, housing, transportation, urban design, and neighbourhoods. This guides the way planning decisions are made in Toronto. Navigating this process can be difficult, leaving communities vulnerable to gentrification. Community land trusts offer a potential solution to this problem. A community land trust (“CLT”) “is a non-profit organization that obtains land (through either purchase or donation) and holds it in perpetuity for the community”. CLTs allow land to be owned by a community, rather than an individual or corporation. This allows community members to ensure that, in the face of gentrification, they will still have access to community recreational spaces, green spaces, and/or affordable housing, depending on the focus of the CLT. Examples of community land trusts are the Toronto Islands Residential Community Trust, the Heatherington Land Trust, and the Parkdale Neighbourhood Land Trust (“PNLT”). The PNLT was incorporated in 2014. It was formed with the vision of acquiring land to lease to non-profit partners to “provide affordable housing, furnish spaces for social enterprises and non-profit organizations, and offer urban agriculture and open space”. The Milky Way Garden is the PNLT’s first piece of community-owned land. For 11 years, a portion of the land was used as a community garden by members of an ESL program at Parkdale Public Library. In 2016 the private owners sold the land to the PNLT, who will preserve the land as a community space, and provide a lease to Greenest City to operate the site. The creation of the Milky Way Garden is a positive step for environmental justice in Parkdale. It will allow community members to gain environmental benefits through the retention of outdoor community space and increased access to fresh and affordable food. As Parkdale continues to change, the PNLT’s CLT model will work to keep the neighbourhood accessible and enjoyable for the entire community. Community land trusts do not stop the process of gentrification. However, they offer a way for community members to band together and have their voices heard, while negotiating to be a part of the inevitable change occurring in their communities. Therefore, the answer to the question posed at the beginning is a qualified ‘yes’, with a lot of creativity and collective action, the law can be used to offset the negative effects of gentrification through the implementation of innovative new ideas like a community land trust model.